Prime Minister Gordon Brown has apologised after he was caught on microphone describing a voter he had spoken to in Rochdale as a "bigoted woman". 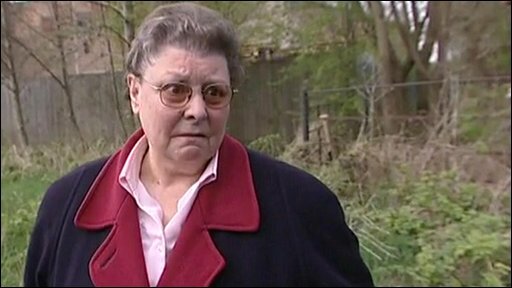 Gillian Duffy, 65, had challenged Mr Brown on a number of issues including immigration and crime. Below are the exchanges that led to the row - and Mr Brown's apology on BBC Radio 2's Jeremy Vine programme. 1141 BST: While on a walkabout in Rochdale, Greater Manchester, Mr Brown speaks to Mrs Duffy. Gillian Duffy: How are you going to get us out of all this debt, Gordon? GD: Three main things what I was drummed in when I was a child was education, health service and looking after people who are vulnerable. GD: But there's too many people now who aren't vulnerable but they can claim and people who are vulnerable can't get claim, can't get it. GD: You can't say anything about the immigrants because you're saying that you're... all these Eastern Europeans what are coming in, where are they flocking from? PM: A million people come from Europe but a million people, British people, have gone into Europe. You do know that there's a lot of British people staying in Europe as well? Their conversation continues for a few more minutes, with Mrs Duffy mentioning university tuition fees and her grandchildren, before Mr Brown congratulates her on her choice of red jacket. He tells Mrs Duffy to take care, before they part. 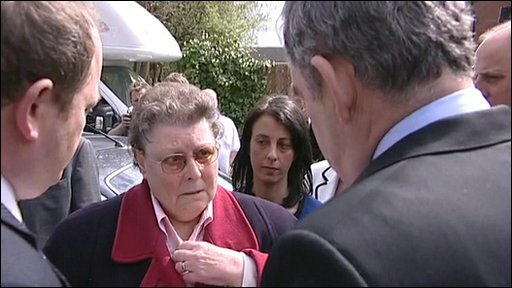 Gordon Brown describes pensioner as a "bigoted woman"
1144 BST: Mr Brown gets in a car and is driven away - while still wearing his microphone. PM: That was a disaster. Should never have put me with that woman ... whose idea was that? Second voice: I don't know, I didn't see her. SV: What did she say? PM: Ugh, everything - she's just a sort of bigoted woman, said she used to be Labour. It's just ridiculous. 1229 BST: Mrs Duffy speaks to reporters. Iain Watson (BBC): We are live at the moment, the prime minister's being interviewed by the BBC, what would you like to say to the prime minister? GD: I'm not saying anything more to him. GD: I am really disappointed. Niall Paterson (Sky): Mrs Duffy you came here with very specific concerns about your pension, and he responded positively to those, you thought? GD: It was about the tax being paid and pensions, and the national debt. NP: But you've just watched that, you've heard the prime minister's words in the Sky truck? What is your instant reaction to that? GD: Very upsetting, I'm very upset. IW: Did you expect that from him? GD: No. He's an educated person, why has he come up with words like that? He's going to lead this country and he's calling an ordinary woman who has just come up and asked him questions - what most people would ask him, they're not doing anything about the national debt, it's going to be tax, tax, tax for another 20 years to get out of this national debt - and he's calling me a bigot. NP: You told me you were a lifelong Labour supporter, then you have a postal vote registered, will you be sending that? IW: You also told me earlier, you said when I asked will he stay at No 10 and you said, hopefully he will. GD: Well, I'm not bothered whether he does will not now. I don't think he will. IW: Do you think he should meet more voters like you? NP: Let's just - if we can - talk about why you were here in the first place. The prime minister has been at great pains this week to try and get out and speak to real people. GD: Why has he come here to this place? Why didn't he go into Rochdale where a lot of people could have spoken to him? In the town centre? Why is he here? (Flurry of reporters' questions) Well, I should think so. Nobody knew he was here, did they? I was walking up the street and the police said the road's cordoned off. Then I saw... I asked the policeman, 'Is Gordon Brown here?' And he said, 'Yes, up there.' So I came up to ask him what is he going to do about the national debt. NP: And when he responded to you, before he got in the car and said what he said I mean, what was your reaction to the way in which he had dealt with your complaints? GD: Well I thought he was understanding but he wasn't, was he? The way he's come out with those comments in the car. NP: What did you think of his character before this event? He's obviously said he's a moral compass, he's honest. GD: I only met him for two of three or four minutes in that interview. His character on TV? Well, he hasn't really enthralled me with his speeches... but I like Blair, Tony Blair. 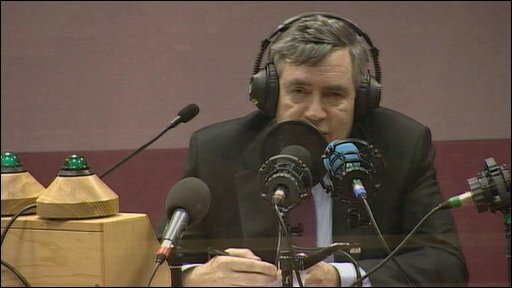 NP: Why do you think Gordon Brown said what he said? GD: I don't know. You tell me. You saw me talking to him. NP: Is that what you expect of a politician, a prime minister? GD: No. No I don't. 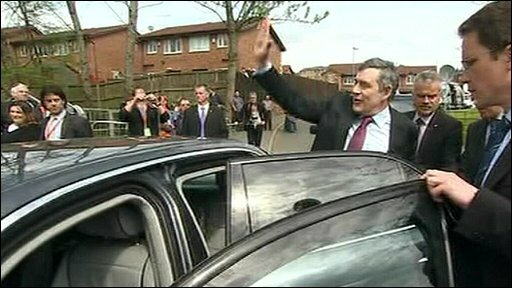 NP: Before today, what was your view of Gordon Brown as a man, as a politician? GD: I can't tell you as a man. As a politician, when he was chancellor he did very good things for the country. But now it's just all gone to pot. You've got to sort it out else we'll be paying, your children and grandchildren will be paying for all of this debt. Brown: "I apologise if I've said anything that has been hurtful"
1244 BST: Mr Brown is quizzed about the incident on BBC Radio 2's Jeremy Vine programme. PM: I apologise if I have said anything like that. What I think she was raising with me was an issue about immigration and saying that there were too many people from eastern Europe in the country. And I do apologise if I have said anything that has been hurtful and I will apologise to her personally. Jeremy Vine: That is what you said. Is she not allowed to express her view to you? PM: Of course she's allowed to express her view and I was saying that. The problem was that I was dealing with a question that she raised about immigration and I wasn't given a chance to answer it because we had a whole melee of press around us. But of course I apologise if I said anything that has been offensive and I would never put myself in a position where I would want to say anything like that about a woman I met. It was a question about immigration that really I think was annoying. JV: You're blaming a member of staff there, Sue. PM: No, I'm blaming myself. I blame myself for what is done. But you've got to remember this was me being helpful to the broadcasters with my microphone on, rushing into the car because I had to get to another appointment, and they've chosen to play my private conversation with the person who was in the car with me. I know these things can happen. I apologise profusely to the lady concerned. I don't think she is that, I think it was just the view that she expressed that I was worried about that I couldn't respond to. 1542: Mr Brown speaks to reporters after meeting Mrs Duffy at her home. PM: I've just been talking to Gillian. I'm mortified by what's happened. I've given her my sincere apologies. Brown: "I made a mistake and am sorry"
I misunderstood what she said and she has accepted that there was a misunderstanding and she has accepted my apology. If you like, I'm a penitent sinner. Sometimes you say things that you don't mean to say, sometimes you say things by mistake and sometimes when you say things you want to correct it very quickly. So I wanted to come here and say to Gillian I was sorry, to say that I'd made a mistake, but to also say I understood the concerns that she was bringing to me and I had simply misunderstood some of the words that she used. So I've made my apology. I've come here, it's been a chance to talk to Gillian about her family and about her relatives and about her own history and what she's done. But most of all, it's a chance for me to apologise and say sorry and say sometimes you do make mistakes and you use wrong words and once you've used that word and you've made a mistake you should withdraw it and say profound apologies and that's what I've done.